The most pleasant surprises from Ubisoft seem to be coming in downloadable forms. Child of Light, Valiant Hearts, Assassin's Creed: Freedom Cry. 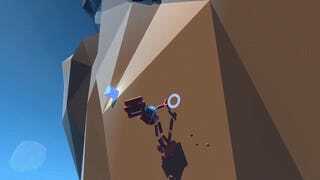 We can now add Grow Home to the list, an utterly charming experimental platformer about climbing higher and higher and higher. I'd intended to start Dying Light yesterday. Zombie are kind of my thing, you know? Video game zombies, movie zombies, zombie zombies. Doesn't really matter. Having finished Gravity Ghost and Life Is Strange back-to-back, I was looking for something a little less...whimsical. Instead, I'm now drowning in whimsy. It took only minutes for Grow Home to win me over. We didn't know about Grow Home until two weeks ago. Literally! It was revealed on a Thursday night to little fanfare. Ubisoft quietly announced an internal demo by Reflections had received some buzz within the office, prompting the company to polish it up and release it for everyone. Reflections is the internal studio best known for working on everything driving at Ubisoft. Based on my time with Grow Home, maybe they should be doing more robot climbing games. Players control a Botanical Utility Droid, otherwise known as BUD. (While I was playing Grow Home, I was drinking a PBR, not a Budweiser. It was a missed opportunity.) BUD's a goofy 'n disturbingly flexible robot assigned to harvest plants designed to oxygenate his homeworld. In game terms, it means BUD is collecting things, climbing things, and making things grow taller. Ultimately, BUD is trying to navigate back to his spaceship, which is really high up in the sky. Ubisoft has an obsession with making climbing fun in games, which I'm totally on-board with. It must be an extension of my continual love for platforming games. There's something about motion and movement that pulls me, whether it's jumping onto a faraway block in Super Mario Bros., sliding under a pipe in Mirror's Edge, or scaling an enormous mountain in Grow Home. There is a massive difference in approach with Grow Home, though. In Assassin's Creed, parkour movement has become largely automatic. If you want to reach somewhere, the game lets you do so holding down a single button, and the game does all the hard work. This can lead to moments where the character scrambles up the wrong ledge of leaps off the incorrect rooftop, but for the speedy pace of Assassin's Creed, but it beats tapping a button over and over again. 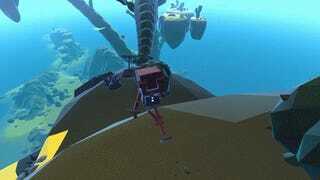 Grow Home is much more methodical, deliberate, and purposeful. The game makes you earn progress. BUD's hands map to the buttons (or triggers) on an controller. It's possible to play Grow Home with a keyboard and mouse but not recommended. This is built for a gamepad. The left bumper locks BUD's left hand into place, while the right bumper does the same for his right hand. In most cases, you can alternate between the two and get moving without much thought, but as you move higher and higher, the game demands more thoughtful placement of hands. When the game opens, BUD can't do much but climb. Scattered throughout the world are tiny, humming crystals, and if you collect enough of them, BUD gains a new ability. First, it's jumping. Next, it's the option to move the camera way back, providing a much greater view of the world. It's useful for trying to find crystals hanging out in odd spots. I'm not a completionist and typically avoid collectables in video games because most developers haven't made it worthwhile to seek them out. Completing a checklist is not enough motivation to collect yet another object, no matter how shiny it may be. And yet, I'm determined to find everything here. What makes the difference is the reason you're collecting them. It's meaningful! BUD can pull off cooler moves by finding more crystals, and the crystals themselves are squirreled away in clever places that always feel just slightly out of reach. Just before I turned off the game last night, BUD could now briefly zip around on a jet pack. Hell yeah! I'm comin' for ya, crystals! 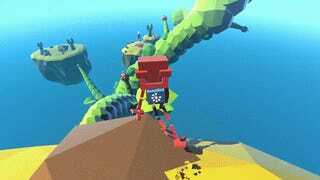 More to the point, Grow Home is a game about climbing and the climbing is satisfying. Carefully placing each hand brings me a tiny joy, the story of how you place his left hand and his right hand, and how you desperately grab a nearby ledge when you fumble the next spot. To give BUD more abilities, you'll have to wander into more challenging territory, forcing you to stress over every hand placement. The collecting informs the mechanics and mastery is rewarded. I don't know if I'll find every hidden crystal in Grow Home, but I'll surely try. It's far different from how I felt about Assassin's Creed Unity, a game where I wanted to turn off the game's litany of useless chests. Finding chests wasn't interesting and what was inside wasn't fulfilling. Ubisoft has a bigger design problem, and Grow Home underscores it. Grow Home was announced on a company blog and dumped onto Steam. The game doesn't even have uPlay integration. It's easy to applaud the latter, but it also means Ubisoft doesn't care very much about Grow Home. It represents a throwaway. For its big releases, there's a design funk at the company. I'm glad Grow Home and Valiant Hearts exist, but why is most interesting work showing up in games meant for the fewest eyeballs? How come Assassin's Creed and Watch Dogs aren't this inventive and risky? There are clearly people who want to do big, daring stuff. But hey, at least we have Grow Home. I'll take it. Few games put a smile on my face while I play. Grow Home has that distinction. Right now, I wish I was scaling another set of vines. When work is over, I'll be climbing towards the sky.